Our staff always wears a two-part uniform consisting of white. They are all fully accredited with a Santa Rita identification badge on the chest so that hospital security staff recognises our team easily. Its look is elegant and its attitude adapts to the daily service of customs and requirements. 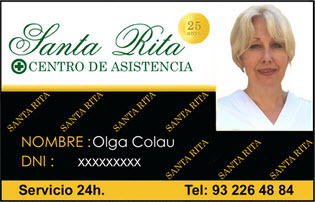 In addition, a weekly check is in place to ensure quality standards within the staff, monitored by Santa Rita. Of course, we offer reassurance to families knowing that even if they live abroad they shall be informed in actual time about everything that happens, at home or in the hospital. We manage any action necessary in case of urgency from our centre 24 hours a day. Families who invest in their health but do not economise for the time of need require impeccable care, therefore we live up to your needed standards.